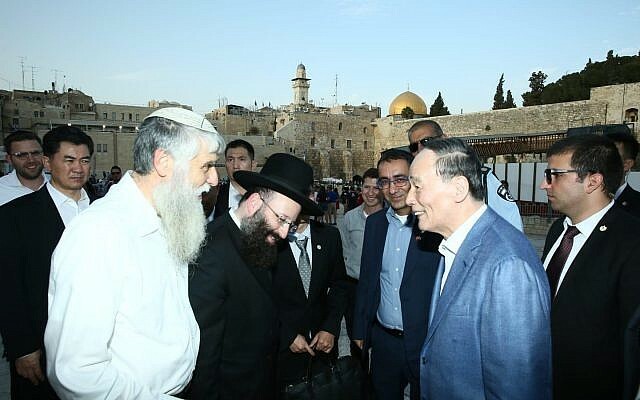 Wang Qishan, the most senior Chinese official to tour the Jewish state since 2000, visits Western Wall accompanied by Israeli officials during trip focusing on economic cooperation. 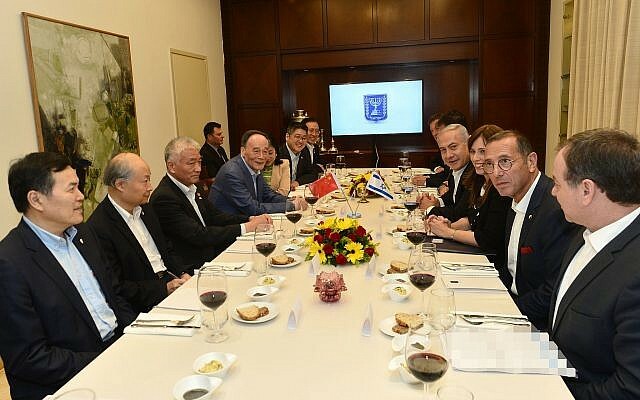 Prime Minister Benjamin Netanyahu hailed ties between Israel and China as met with Chinese Vice President Wang Qishan for a working dinner in Jerusalem on Monday. The dinner at the prime minister’s official residence was attended by Industry Minister Eli Cohen, Deputy Foreign Minister Tzipi Hotovely, National Security Council Director Meir Ben-Shabbat, head of the Prime Minister’s staff Yoav Horowitz, National Economic Council Chairman Avi Simhon, and Israel’s Ambassador to China, Zvi Hefetz. The Chinese delegation to the dinner included Science and Technology Minister Wang Zhigang, Vice Minister of Foreign Affairs Le Yucheng, Vice Minister of Commerce Qian Keming and Chinese Ambassador to Israel Zhan Yongxin, as well as other senior officials. Wang arrived in Israel Monday for a four-day visit focusing on high-level talks on economic cooperation. Wang, 70, is the most senior Chinese official to visit the Jewish state in nearly two decades. In April 2000, Jiang Zemin became the first-ever leader of the People’s Republic to visit Israel. 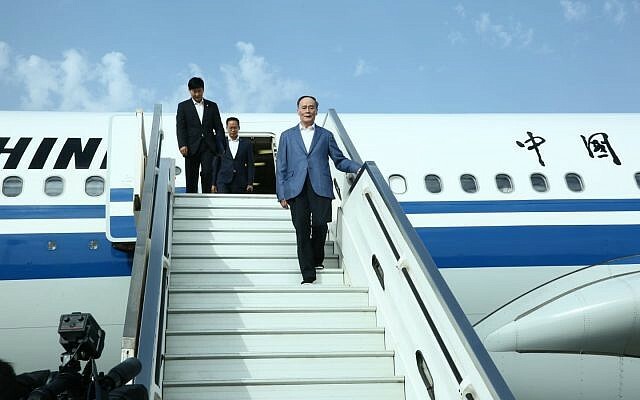 Shortly after arriving on a special Air China flight, Wang, the country’s eighth-highest-ranking official, headed to the Old City of Jerusalem, where he visited the Western Wall and the Church of the Holy Sepulchre. The Old City is in East Jerusalem, which Beijing does not recognize as Israeli territory. Nonetheless, Wang was accompanied during there by two senior officials from the Foreign Ministry: chief of protocol Reuven Meron and deputy director-general for Asia and the Pacific Gilad Cohen. Wang, who was greeted at Ben-Gurion Airport by Water and Energy Minister Yuval Steinitz, was accompanied by a large delegation, including two ministers and 12 deputy ministers, according to the Foreign Ministry in Jerusalem. Wang, who is considered close to President Xi Jinping, is set to meet President Reuven Rivlin on Tuesday. Later this week, Wang is to co-host the 4th meeting of the China-Israel Joint Committee on Innovation Cooperation together with Prime Minister Benjamin Netanyahu. “The JCIC convenes annually, alternating between Beijing and Jerusalem. This year, the Chinese delegation to the meeting will includes high ranking officials such as ministers and deputy ministers from 13 Chinese government ministries,” the Foreign Ministry said in a statement. Netanyahu and Wang will co-chair a Wednesday meeting of the Joint Committee at the Foreign Ministry. Beijing and Jerusalem are both seeking to advance issues of mutual interest during this week’s meetings, such as a possible free trade agreement or a 10-year multiple entry visa agreement for tourists and businesspeople, according to the ministry. Wang will also attend the Prime Minister’s Innovation Summit and the ceremony inaugurating the Peres Center for Peace and Innovation. Ahead of his visit, Israeli officials were quoted as warning of getting too close to China as the Asian giant could pose a possible security risk. Some in Jerusalem have expressed worries about Chinese companies participating in massive infrastructure projects and about the sale of Israeli technology to Beijing. Officials have reportedly warned that some infrastructure projects could introduce the possibility of China spying on some of Israel’s most sensitive assets. 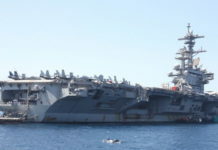 A report in The Economist recently noted that a Chinese company, Shanghai International Port Group, has been building a new commercial shipping facility in Haifa, Israel’s busiest port, where the country’s fleet of submarines, believed to possess nuclear capability, docks. The report cited one unnamed Israeli minister as saying that it was “astonishing” that neither the cabinet nor the National Security Council had had any input on the deal with Shanghai International Port Group. 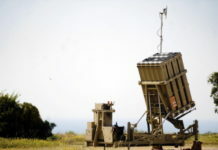 While Israel cut off weapons sales to Beijing in 2005 due to protests from the United States, the report said officials are concerned about “dual-use” products being sold to China, such as artificial intelligence and cyber-tech, which can be used for policing and military purposes such as intelligence gathering and surveillance. The report quoted Israeli businessmen as saying the Chinese are eager to obtain such dual-use products, and that although there is some regulation in place, there are many loopholes. “Israel has to do business with China, of course, but there is no serious mechanism to make sure that we don’t sell off key economic assets and valuable technological knowledge,” Efraim Halevy, a former head of the Mossad, told the magazine. Some have also noted that Jerusalem may be wary of crossing the US, which is in a trade war with China, by getting too close to Beijing. Israeli exports to China increased dramatically, by 62 percent, in the first eight months of 2018 compared to last year — from $2.14 billion in 2017 to $3.5 billion — according to Israel’s Central Bureau of Statistics. Imports from China increased by 10%, from $4.45 billion last year to $4.9 billion in 2018. 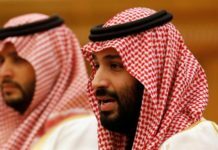 Before that, China, the world’s most populous country and second-largest economy, was still regarded as a “relatively minor player” in the Israeli economy, focusing almost exclusively on strategic investments and making up at most 5% of the total activity in Israel, a report by IVC Research Center said in February. Netanyahu has reportedly been less than eager to create a government agency that would provide more rigorous oversight of trade with China. Previous articleHow Close to China Is Too Close for Israel?